The SpecialCleaner 20 is an electric ventilation duct-cleaning machine with a rotation speed of 550 rpm. It is designed to clean inside the surfaces of small ducts ranging between 100-600 mm, although only 400-600 mm ducts have to be vertical flues. The SpecialCleaner 20 has a 20 m cleaning shaft, which enables it to clean up to 35 m of duct when extended in either direction from one hatch. The SpecialCleaner 20 is extremely handy in tight places, giving it the edge over other cleaning machines. As a small machine, it can quickly be set up for use or transportation. It has an extensive reach and a suitably long feed cable. The reel for the flexible shaft is designed to wind the slack back into itself to prevent the shaft from coming into contact with dirty floor space during cleaning. The machine is also equipped with two power out tapping points for lights and drills. The rotation direction can be changed using the pneumatic foot control. Changing the direction of rotation enables the user to navigate the brush through bends in ducts. All Lifa Air brushing machines can clean round or rectangular ducts. The correct choice of brush and cleaning technique ensures that rectangular ducts can also be cleaned. 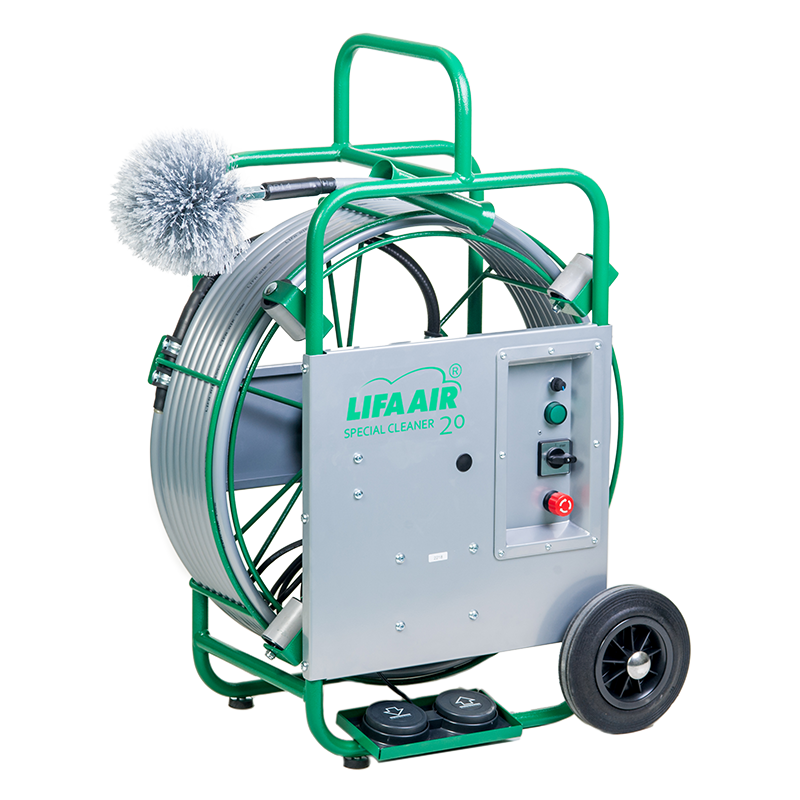 Connecting Lifa Air’s low pressure cleaning machines to an AirClean 8000, HepaClean4000 or HepaClean 2500 to the duct ensures the complete removal of all dirt brushed loose in the ventilation duct.